At least 1 day in advance. 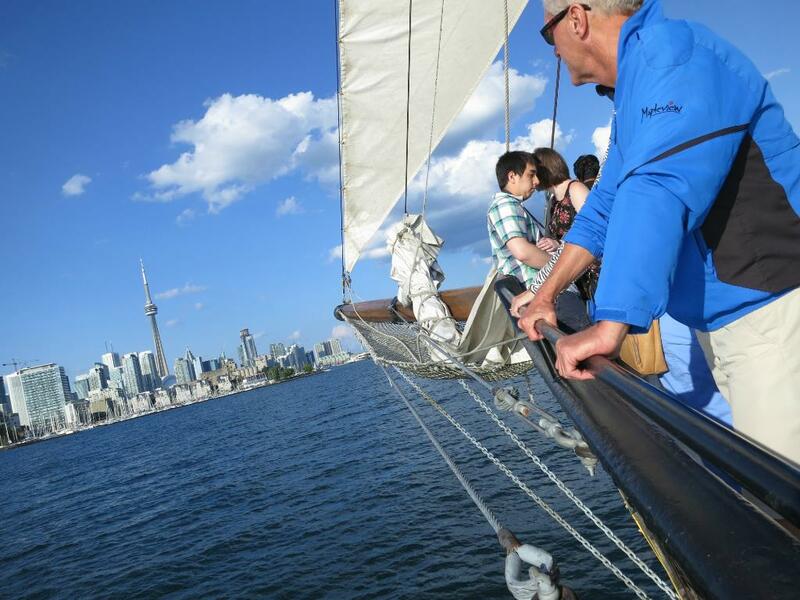 Since 2000, Kajama has provided Toronto with a spectacular day and evening sunset sailing experience. We sail on our boat cruise every weekend from the beginning of May, all the way until the end of September! 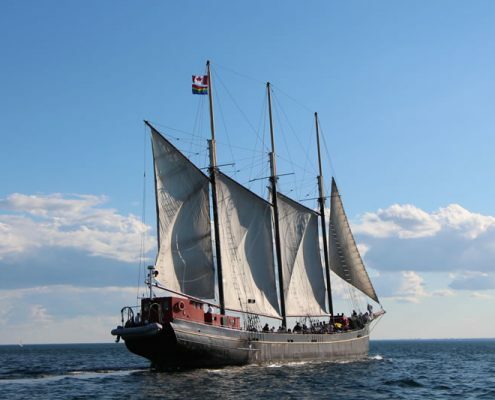 You can even sail with us daily from June until Labour Day. The 2 hour day or evening sunset Toronto harbour boat cruise consists of a 30 minute boarding time, and an hour and a half sail out on the open waters of Lake Ontario. 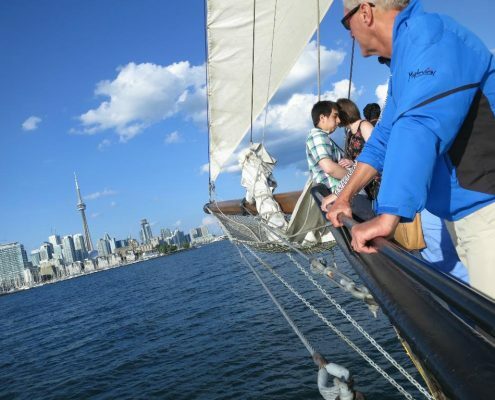 You can sit back and relax and take in the sights of downtown Toronto or assist our crew to get the full sailing experience. With the affordable price of $26.99 for adults, $14.99 for children 5 and up, $2.99 for kids 4 and under, and $23.99 for seniors, it is a perfect relaxing way to spend a nice summer’s day. 3 Hour tour includes 2.5 hours of sailing. Absolutely the best location to take pictures of Toronto. The highest rated Toronto City Boat cruise. Cancel any time before the tour date and receive a full refund. Yes! 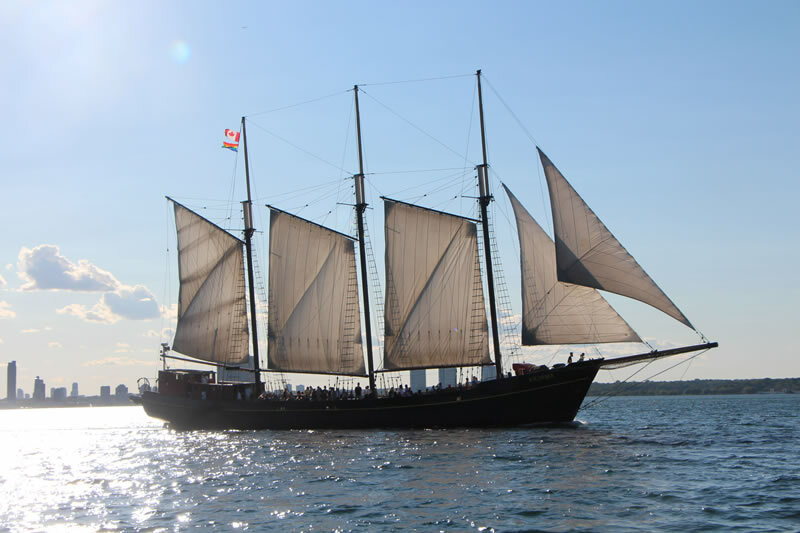 We have 7000 sqft of sail on board a 165’ gaff-rigged schooner. Kajama has been sailing since 1930 and we promote an actual sailing experience. Obviously we need wind to sail so if you are looking for a more exciting adventure be sure to visit us on a windy day. 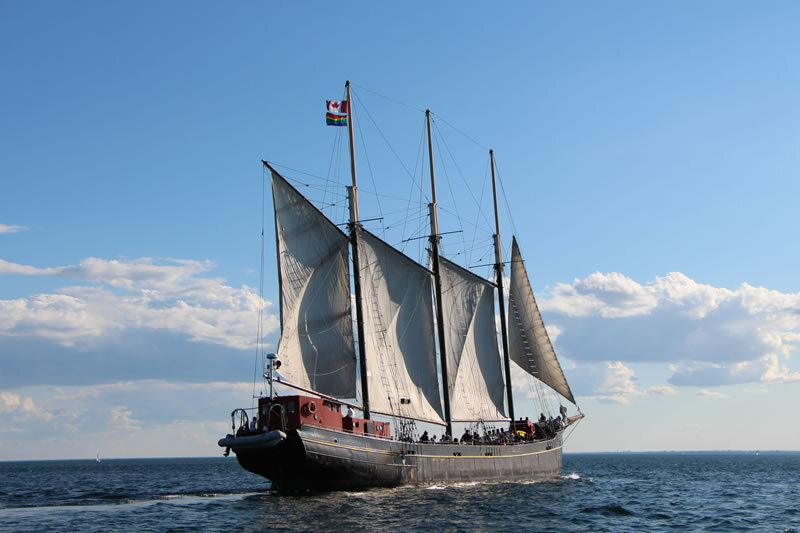 Into the first 30 minutes of our voyage, the sails will be raised by our crew and volunteers such as yourself, and we will sail through Toronto Harbour. You are welcome to spend the sail relaxing with a cold drink or exploring the ship, listening to the crew singing sea shanties, helping raising and lowering the sails or talking with our experienced crew. Be sure to keep your eyes open for the firing of the cannon at any foreign ships that may try to sneak upon us! 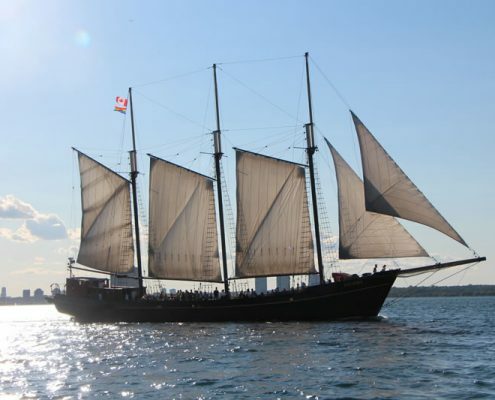 While traveling aboard one of Toronto’s best attractions, why not add a delicious meal or drink to your sail? We use only the freshest produce, and our poultry and protein arrive fresh daily! Your lunch or dinner on our boat cruises will be cooked for you right on board in our state of the art kitchen facility. 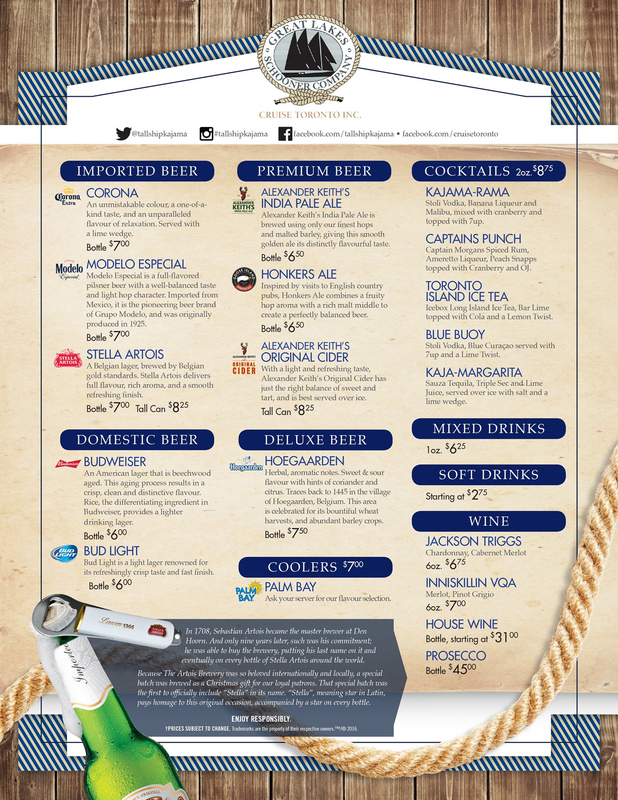 With our fully licensed bar, you can also sit back and relax on your lunch or dinner boat cruise while enjoying a nice cold drink. We are confident that you will agree we produce some of the best food Toronto has to offer with a great view of the Toronto harbour thrown in! You can cancel anytime on TorontoTours.ca before the tour date and receive a full refund. No questions asked. Refunds are not permitted on or after the tour date. You can contact Kajama directly to have the ticket transferred to another cruise date for an administration fee of $5. It is acceptable to have another person(s) use your paid reservation if you are unable to attend. We cruise in most types of weather. We have canopies on the outside deck that are put up if there is rain. You can still be outside and have a great view even while it’s raining. Of course we will cancel the tour and offer full refunds if it is unsafe to sail on your day. The entrance onto the boat and the outside deck is wheelchair accessible for the Kajama. The washrooms are located inside and down a flight of stairs that are not wheelchair accessible. Our sailings can be fully enjoyed even in a wheelchair as long as washroom facilities are not needed. There are wheelchair accessible washrooms located very close to both vessels docking locations. Smoking is permitted on the outside decks of the vessels. It is not permitted inside. Does the Boat Have and Engine? Yes, we have three. Two for electrical requirements, Generators 35KW and are newest electronic Caterpillar C18 engine which was installed in 2005. The engine is used to disembark and return to the dock and tight maneuvering. We are required by law to have engines. Yes. 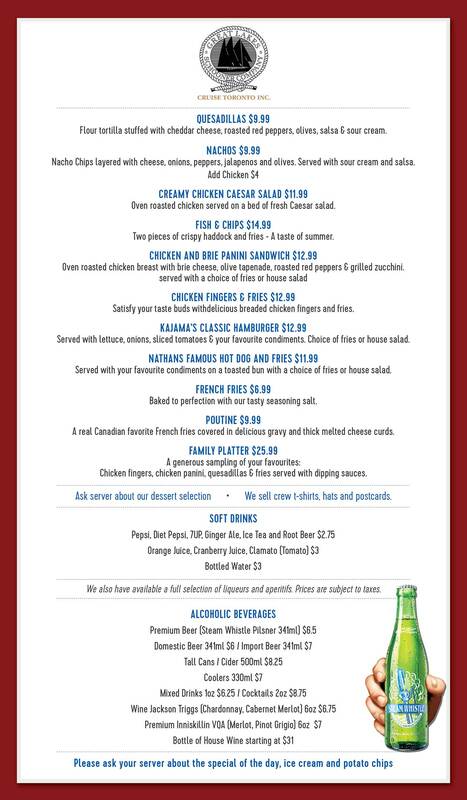 We serve food and drinks. It is very affordable, and an excellent way to enjoy the views. Is Kajama Safe for Children and Infants? Yes absolutely. Every year we take thousands of children on board our vessels. We are transport Canada certified and have children’s life vests on board. It’s a great experience children of all ages can enjoy.